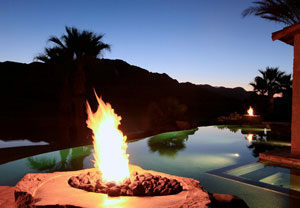 Azure Pools & Spas, Inc. is a licensed and insured custom pool builder serving the Coachella Valley since 1989. When you are ready to make your dreams a reality, our trained sales staff will come out to your home, sit down with you and talk about your vision. If you do not really have one yet, we will help you with the use of pictures of completed projects, discussing options, functionality of the pool, how you entertain and finally budget. During our visit measurements will be taken to see what size of the pool will fit to meet local code and pool equipment locations. Once we have covered these topics we will be on our way to creating a custom design just for you. Azure Pools & Spas also specializes in remodels, such as spa additions, shallowing in deep pools, adding tanning shelves and salt water systems or completely removing an existing pool and starting over to create your dream pool. Swimming pool / spa projects are an exciting addition that adds fun for your family, low impact exercise, spa therapy for those aches, and a fabulous area to entertain as well as adding value to your home. This process is an art form that begins with your dream and then takes shape in your back yard. There are many shapes and sizes available to meet a wide range of budgets. Whether it is a simple freeform splash pool, more modern edgy linear design, natural rock lagoon style pool, lap pool for serious swimmers, or the cutting edge of perimeter overflow pools; Azure Pools & Spas is the number one choice to provide you with top quality at reasonable prices. Our craftspeople make it make it look easy, but it takes a lot of time and experience along with a lot of hard work to gain the knowledge and ability to do what they do. We offer custom pool design services to all Palm Desert, Palm Springs, Indio, Rancho Mirage, Indian Wells, Bermuda Dunes, La Quinta and Cathedral City. Contact us today for a design consultation.